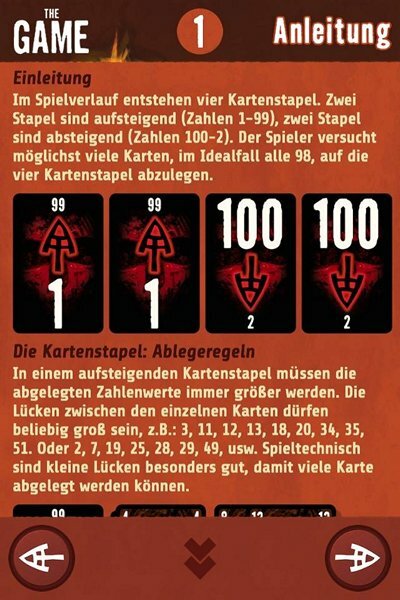 Today, on their Facebook page, German development studio, Outline Development teased their upcoming digital release of Steffen Benndorf’s 2015 Spiel des Jahres Nominee ‘The Game‘. 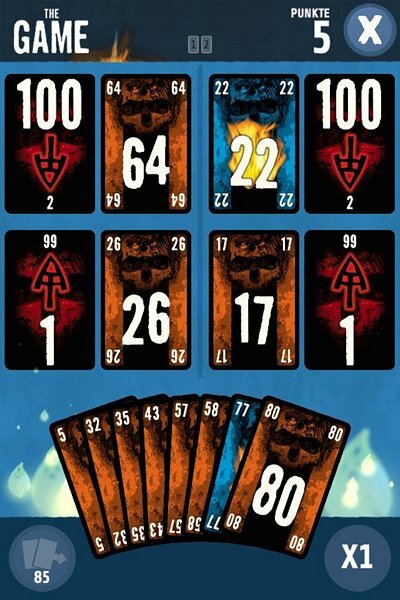 For those unfamiliar, The Game is a solo or cooperative card game for up to 5 players, where you are trying to discard all 98 cards in the deck (numbered from 2 to 99) onto four discard piles in the center of the table. Each player starts with a hand of 6 to 8 cards and the four common discard piles designate the numerical direction in which cards may be discarded on each individual pile. Two piles start with the number one and cards must be discarded on these in increasing numerical order and two start with the number 100 and cards must be discarded on these piles in decreasing numerical order from whatever number currently appears at the top of the deck. On your turn you must discard at least two cards from your hand onto one or more discard piles and then redraw your hand back up. Players cannot tell each other what specific numbers they are holding, but can suggest that someone else avoid certain discard piles if possible. There are a few additional rules like one which allows you to play numbers out of the standard increasing/decreasing order, but over all it is pretty straightforward. The name causes more confusion than the rules. The images make it look like the app is pretty far along and will feature multiple game modes: Classic, On Fire and Lift Up. As well as leaderboards and achievements. Last October, Outline Development brought us a digital release of 2014 Spiel des Jahres Winner, Camel Up, which was met with mixed reviews. The screenshots don’t really reveal any details as to what number of players the app will support. For instance, will it be just a solo experience or will it allow other local players to join in? Will it support online play? Also, no release date for The Game was given, all it says on Facebook is “In Kürze in einem App Store in deiner Nähe! wink emoticon”, which translates to “In Brief, in an app store near you! wink emoticon”. In addition to The Game, we can expect at least one more digital port in the future from OD as well. As you can see in this previous Facebook post, Outline Development also has the digital rights to the logic dice game Qwixx as well. I assume that work on that title will continue once The Game has launched. More details on both these titles as we get them, but for now enjoy the image gallery below.